A few months back, I was running through Rome's Termini train station to catch my regional train to Terni (a 1km sprint to maledetto Binario 1 est) when I stumbled onto a functioning escalator unbelievably headed upward to a mezzanine level- a curvacesous, all-white wonderland of food shops and glass windows. Everything was illuminated. Everyone was stylish. And everyone had a chair or stool to sit on. Trainspotting heaven. Welcome to La Terrazza. Train stations come in all shapes and sizes, and I love them all- the vintage style of Los Angeles's Union Station, the seaside view at tiny Taormina-Giardini, the looming arches of St. Pancras and everything about Milano Centrale. And I love trains, tracks, conductors and travelers. But most importantly, I love having a place to sit so that I can take it all in. I can like Termini for those beautiful Rationalist arches of slick travertine (on its lateral sides), but I can't say I love it. There's never beena place to just to stop and take in the station, unless you count the rooftop terrace at the Radisson Blu across the street. 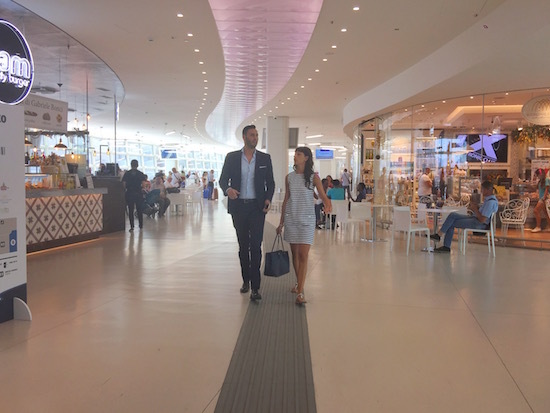 Passengers want more from a station than a pop-up Magnum shop while dodging the ground floor's random sights and smells. We want to be able to enjoy our wait time, maybe ingest something more than a cappuccino, and we want a view. With a panoramic glass wall that looks out on to the platforms, Termini is definitely giving us something to look at. 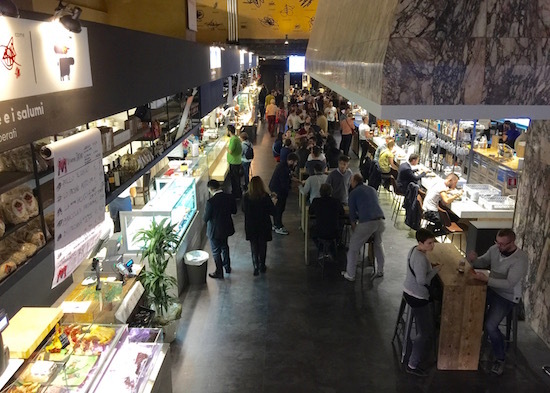 To make it a bit more delicious, La Terazza has line up of fooderies like Ham Holy Burger, Fattorie Garofalo (mozzarella) and La Crostaceria (fish). Finally, Termini is ready to take itself seriously. Walk down via Giolitti or head to Platform 25, and you'll find yourself standing in a monumental room ofgorgeous Fascist-era bricked vaultes. Mercato Centrale is another "best of" Italy food superstore, like Eataly, but with far more emphasis on eating in, not taking out. The clever diner will head up to the third floor alcove to check out Oliver Glowig's La Tavola. For the frequent travel, down the Trenitalia App. It has changed my life. Great design and easy to navigate. And just plain easy for purchase. I've bought and changed tickets within five minutes of departure.